Nestled into the southern tip of the Okanagan valley, Osoyoos is Canada’s pocket desert. The climate here is governed by the Coast Mountain Range that shields the region from the cold and wet weather systems whipped up by the Pacific Ocean 400 km (250 miles) to the west. The result is a hot and dry climate with an annual rainfall of a scant 200 mm (eight inches) and an average temperature of 22°C (71.6°F) during the prime growing months. Compared to many other growing regions around the world, British Columbia is a viticultural paradise. With five individual VQA regions, each with unique climates and soils, viticultural practices vary widely in different areas. The following is general information on British Columbia’s viticultural practice. 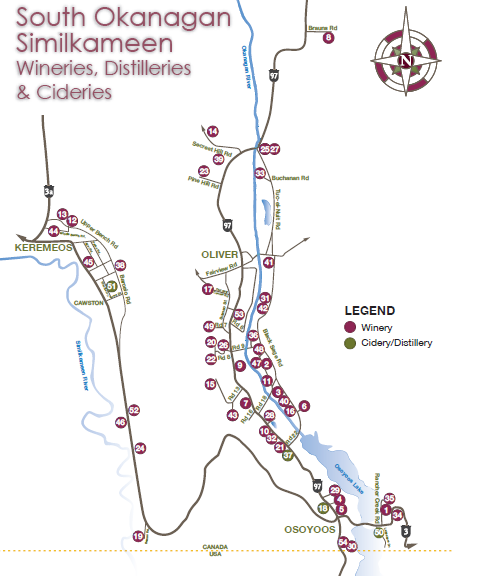 Wineries in the Osoyoos, Oliver, and Similkameen Valley employ thousands of workers each year, including growers, pickers, production, and retail – making this one of the largest industries in the South Okanagan area. There are over 60 varieties planted in BC. Merlot & Pinot Gris remain the widest planted varietals in the province. Yields vary considerably depending on the grower, the variety and the quality aspirations. Generally, the high-quality vineyards crop between two and four tons per acre. Vineyards in BC are irrigated. Most utilize an overhead irrigation system because this method also offers the benefit of frost protection. Many new vineyards have overhead, drip and microjet systems. In order to reduce berry size and improve quality, many growers in BC practice Regulated Deficit Irrigation. This is a method of applying controlled amounts of stress to the vine by limiting water availability. There is no current shortage of water in BC. Vineyards are frequently fenced in order to protect against deer, bears and other animals. Many vineyards are netted against birds when late-harvest or Icewines are being produced. The leafhopper and cutworm are present in BC. There are a few isolated areas of phylloxera, but it does not appear to be spreading and fails to thrive on the sandy soils of the southern Okanagan Valley. There has been no reported incidence of Pierce’s Disease. Due to the dry climate of the Okanagan and Similkameen Valleys, fungal diseases are limited. However, powdery mildew is common, and botrytis bunch rot can appear in wet years and is an issue in vineyards with dense canopies. 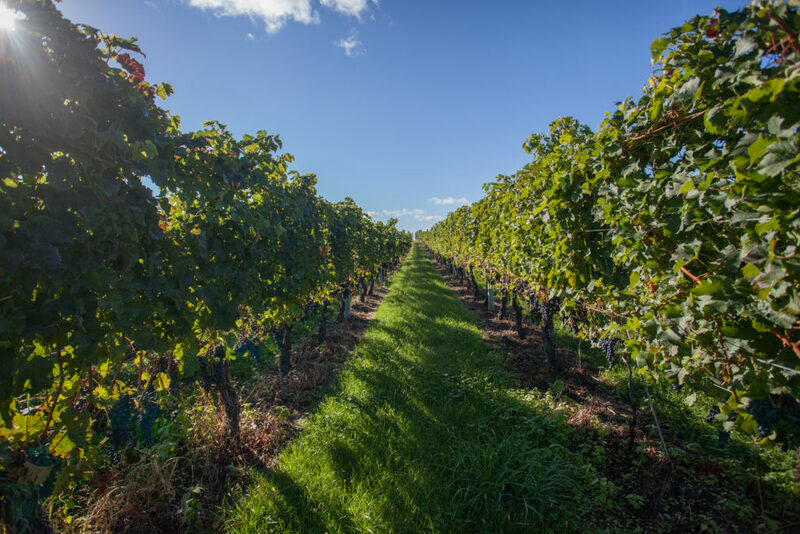 Due to the relatively low necessity for sprays, many growers practice sustainable viticulture by reducing their reliance on synthetic chemicals. The dry climate and low humidity of the Okanagan and Similkameen Valleys are well suited to organic viticulture. Many growers practice organic viticulture but do not seek certification. Only three per cent of BC wine grapes are officially organically grown.